A childhood favorite of mine, this book is about one girl’s determination to help her mother in the face of trouble. When Irene’s mother, a seamstress, falls sick, there is no one to take a beautiful gown to the duchess on the day of her big ball. 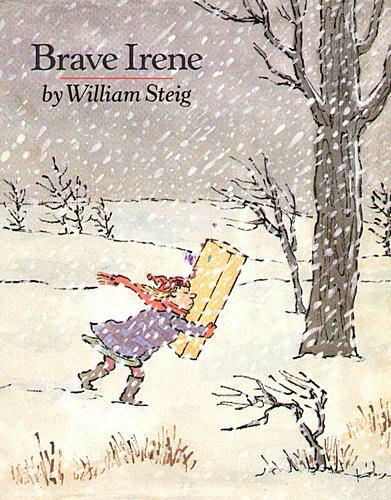 Irene takes on the job, and bounds through whirling snow and bitter wind that taunts Irene, telling her to GO HO—WO—WOME!” After the package flies out of Irene’s arms and the dress blows away, Irene becomes buried in snow and almost gives up. But remembering her mother’s face, she leaps out of the snow and races down the hill to the duchess’s house. She sees the beautiful dress her mom made next to a tree, and is greeted by a glowing fire, a warm meal, and cheerful faces when she knocks on the duchess’s door. William Steig’s classic illustration style—with atmospheric color, bold outlining, and sketch-like detail—shines in this heartwarming story. It is notable that the text is longer than the average picture book, and so I would only use this with a well-behaved preschool storytime group. It is also significant that the story deals with some heavy, questionable circumstances. As I child, I never wondered why Irene’s mother let her go out in the freezing snowstorm, but now I do. I never worried about the implications of young Irene staying overnight in a stranger’s home, but now I do. When Irene gets buried in the snow, she asks herself, “Why not freeze to death, and let all these troubles end?” Of course, the beauty is that she finds hope in the image of her mother’s face and keeps going, but it is definitely intense material for storytime. Yet, the theme of this picture book is hope amidst chaos, and determination in a world that wants you to give up. How can we not share a book with such poignant themes with children?